What is a Chronic Stress Response Pattern? Chronic stress response can be the reason for poor posture. The more neural adaptable you are the more you will function in your primary curvatures. Big words! What do they mean? We all go in and out of stress, self healing and self regulating within the environment. The more stuck we are in a stress response, the less neural adaptable we are and the less we will function in our primary curvatures. When you are stuck in a sympathetic response and have increased tone, you bend the body sideways and protrude the head forward to reduce the tension placed on the cord. This default lateral bending and forward head carriage is why there are unlevel hips, shoulders and heads too far forward of the body. 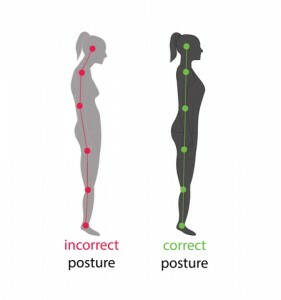 Postural distortions can be looked at as a perfectly orchestrated expression of innate intelligence of the body. Even if the body is not functioning at full potential it is perfectly orchestrated because it is trying its best to reduce the tension on the cord to keep you alive as long as possible at the expense of the musculoskeletal system. Innate intelligence operates in a hierarchy of priorities. When the Central Nervous System (CNS) is stressed, it reverts to survival mechanisms. One of the CNS’s main priorities is to keep you alive as long as it is possible to give you the most opportunity to propagate the species. Innate intelligence knows that it cannot survive without the CNS, the heart, lungs, kidneys and liver, but it can survive with a little back pain. In its infinite wisdom it creates subluxations: Increasing muscle hypertonicity on one side of the spine and flaccidity on the other side. Of course, these musculoskeletal subluxations will cause advanced degenerative changes over time because the body is loaded differently. Innate intelligence knows that the biomechanics are not ideal but it prioritizes organs over muscle. Compensations made by innate intelligence are not bad. These compensations may hurt but they are the sacrifice of increased dural tension. Would you like to know how much your Central Nervous System is compensating in an effort to protect your own biomechanics? Call to book your assessment today!